A couple years ago, Tiger Woods was battling through a back injury and made a statement about how he couldn’t activate his glutes. Of course everybody had a field day making jokes about that. Not me. I actually wrote an article about what he could do to get them activated. You can read that article about Tiger activating his glutes by clicking here. Since that time, I have had more experience treating a deactivated gluteus muscle. But, I’ve also started becoming more familiar with the not-so-famous gluteus muscles that most people have never heard of – gluteus medius and gluteus minimus. 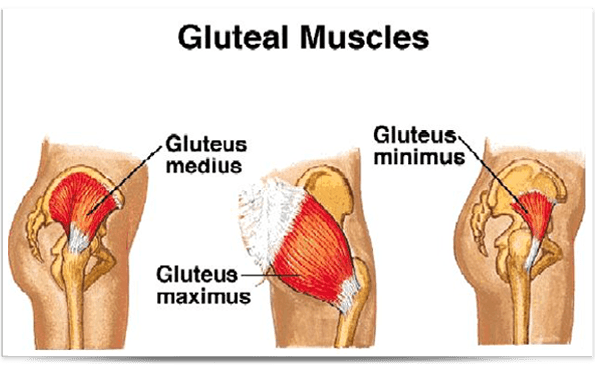 Usually, when an expert talks about the glutes not firing right it is these two muscles and not the gluteus maximus, the big dog. So what do we mean when they aren’t firing right? In order to do any type of movement your muscles have to activate to complete that movement – walking, running, jumping, typing. But, due to imbalances or lack of proper use, these muscles can essentially shut down. Thus, they won’t fire. When they don’t fire, your body doesn’t move right. It can affect your running gait, it can affect your speed, it can affect other muscles to compensate for the inefficiency of the deactivating muscle. The gluteus medius affected my daughter’s running form last year during track. It fatigued so fast and when it did, she looked like an entirely different runner. Her stride shortened and it looked like she was really struggling to finish the race. It looked like she was running in mud. Then we started doing some exercises to fire them up before running. A couple were mentioned in the article with Tiger Woods. A few others, she was on all fours doing some fire hydrants, leg circles, and donkey kicks. You could Youtube those exercises, but they woke the gluteus medius up and then they could fire properly. She was a completely different runner at that point. The day after we started doing these exercises, she dropped 4 seconds in her 400M run. A huge difference I must say. Poor glute activation also plays a role in the knees bowing in on jumps or the legs bowing out in sprints. The same exercises that we mentioned above will also help correct these issues in those athletes. The lateral band walks in the Tiger Woods’ article and clamshells not only help with the gluteus minimus and medius, but also you can draw on the leg abductors to fire as well. Doing these exercises will definitely help correct those issues and get them running a lot better. AND reduce the chances for injuries to happen. If you aren’t doing these exercises, you might want to start. I’m having all my track athletes do them as part of their warmup so we can stop glute deactivation before it starts. You should too no matter what the sport. It affects a lot more than you think.